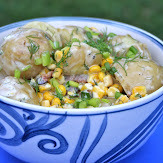 I've also discovered two wonderful blogs in the last month: Dinner with Julie and Taste and Tell. Both very different in their premise, as one is a "cook whatever you have on hand as your creativity wills" and the other cooking and reviewing cookbooks. I have loved both of them for different reasons, and both have inspired me in different ways in the kitchen. I'll tell you more about Dinner with Julie another time, but this post has to do with Taste and Tell. Deb's approach to cooking through her mountains of cookbooks has been to pick 4-5 recipes from a cookbook and cook from it all month long. She has been stretched out of her comfort zone and is also making use of her obsession for cookbooks. While I don't have a ton of cookbooks, I too am guilty of buying them or receiving them as gifts, perusing them and then tossing them on a shelf. I would say one of the most challenging things about meal planning is choosing your recipes. What am I in the mood for? What do I have on hand? What's on sale this week? What can I make that isn't same old same old? My quest for new recipes usually comes from the internet and other food blogs. But there is always something that feels slightly off in making and then reposting another blogger's recipe on my own blog. Not that that isn't allowed, I just feel a bit weird about it sometimes. Deb's idea of cooking your way through a cookbook and then posting a helpful review for others got me really excited. I want to do that. A whole new source of recipes. A whole new source of inspiration in the kitchen. A whole new motivation for posting on this here blog. I can't say for sure if I will have a new cookbook each month like Deb (I don't work well with deadlines), but I'm going to see what this morphs into. 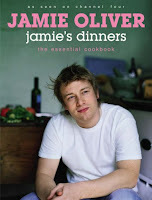 The cookbook I chose to review first is by Jamie Oliver called Jamie's Dinners. My culinary friend Tara has been raving about this book for years and even went so far as to buy it for me for Christmas. I will admit that I read through it when she gave it to me, but then put it away with my other cookbooks and that's where it has stayed. I have already tried a couple recipes from the book that Tara has either made for me or recommended me to make, but it is still rather dusty. I wanted to really give this book a good go at it since Tara has never led me astray in the kitchen before. I anticipate the next few weeks in the kitchen to be delicious ones. Have you cooked from this cookbook before? Any thoughts? Favorite recipes? Haha Tara you are so cute! I thought you might like this new idea. I could never forget that simple tomato sauce you made, and I plan to get my hand on some Italian tomatoes to really do it justice. LOVED the leg of lamb and did I tell you I remade it a few weeks later using pork? I'll be posting that soon as well. I'm not gonna lie, I have at least 15 recipes bookmarked to try! It's going to be hard to choose which ones to make in the next few weeks to add to the review. I'm really excited! I'm rarely ahead on my meal plans, but I already have next weeks planned out because I couldn't wait to try some of these recipes! It's amazing what picking a cookbook to work through that you are inspired by can do for your motivation in the kitchen! I find myself inviting people over for supper just so I have an excuse to cook through the recipes faster.